At Virtual Built, we typically create a federated Revit model for every project we work on. This allows us to run a host of automated processes on the links, right from the federated file. Recently we received a dataset for a high rise building. The Architect had used 5 typical linked ‘module’ files, copied throughout a master file. Next challenge: how can we quickly promote those nested links into our federated model? Well, we currently have the module files populated, so how can we leverage those positions to promote the nested links? Copy / paste the link Instances from the module file (Level 0 or Base Level) into the empty file (Level 1, default level). You can use Dynamo graph above. Save the new proxy file as ‘ModuleContainer’ or similar. We know have a file that only has link instances in it. replace with the ModuleContainer you created. Once you have done all the modules, you are ready for binding as described below. Your nested links are now promoted! Copy / paste the populated free instances from the detached Federated Model to the real Federated Model. Use the Dynamo script to collect them. Tip: Paste into a closed workset for better performance. The only thing we technically ‘broke’ or lost in this process is the module link->nested link relationship. So if someone decides to move one of the nested links in the module link, obviously that won’t replicate into the Federated Central file. Hope this helps some of you out there building or dealing with large federated models. 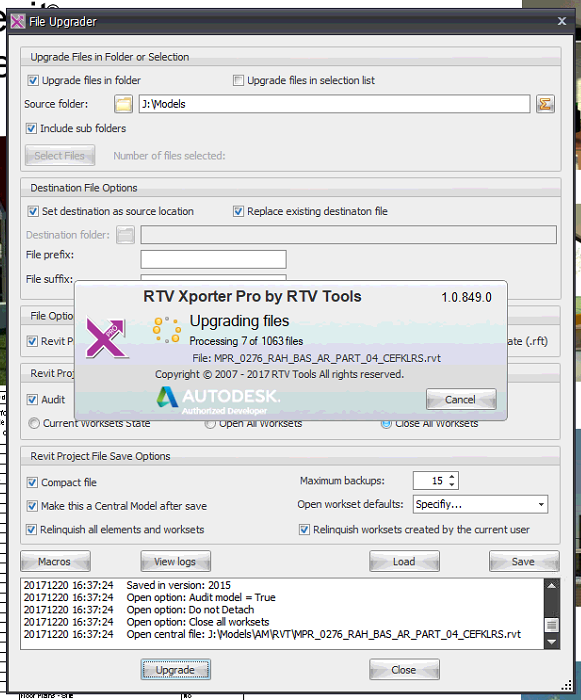 Revit gets a new version every year, and every year we theoretically have to upgrade our Revit files. If you are a pro-active BIM Manager, you also have to upgrade a bunch of families and other files. 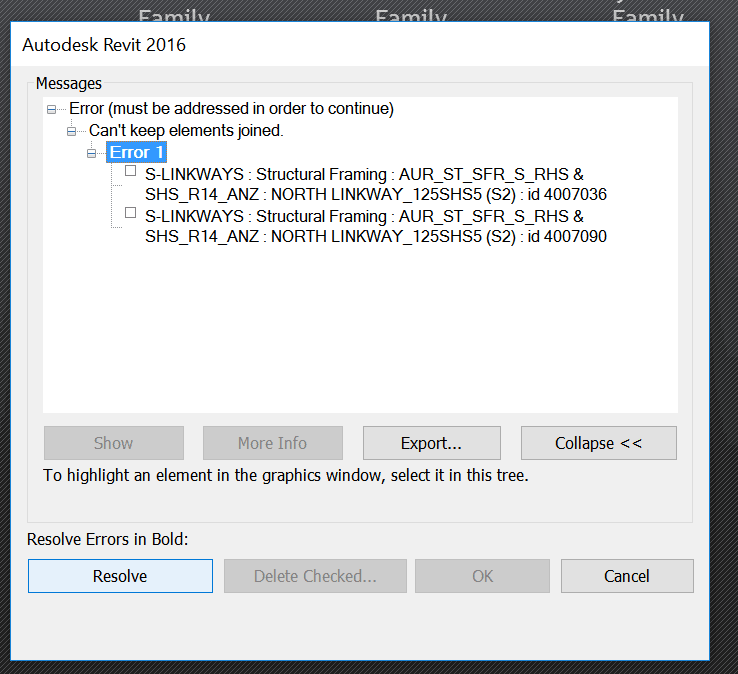 If you are working on certain large projects, maybe the updates are deferred for a year or two, and then you find that you have to upgrade about 800 Revit files from Revit 2015 to 2018. Obviously, they all have to upgraded at once to maintain the integrity of the data and the workflows. What is the best way to do it? I investigated a few different options and my notes and links are list below. In my case, I decided to go with RTV Xporter Pro and its File Upgrader option. It is an extremely affordable addin (currently $49USD), considering the amount of batch processing functionality that it provides. The very first thing to do is ensure you have a backup. In my case, I had a complete offline mirror of the Revit files, and I ran the upgrade against that mirror. Then, I could just overwrite the live network location once I confirm that everything works as expected. 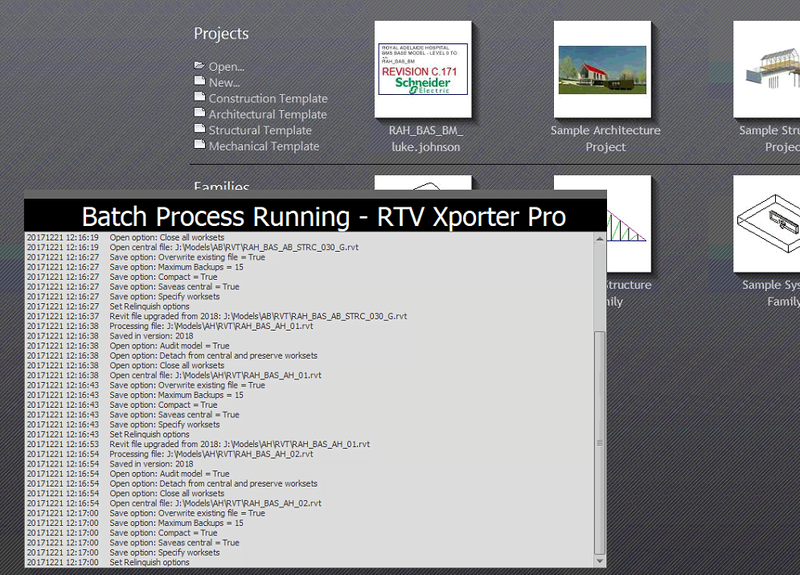 I would say that another thing to do is to create some form of data snapshot of your Revit models prior to upgrade. I have a method of doing this which is pretty powerful, but its a secret (for now). Set up a File Upgrader XML file (my settings shown below). 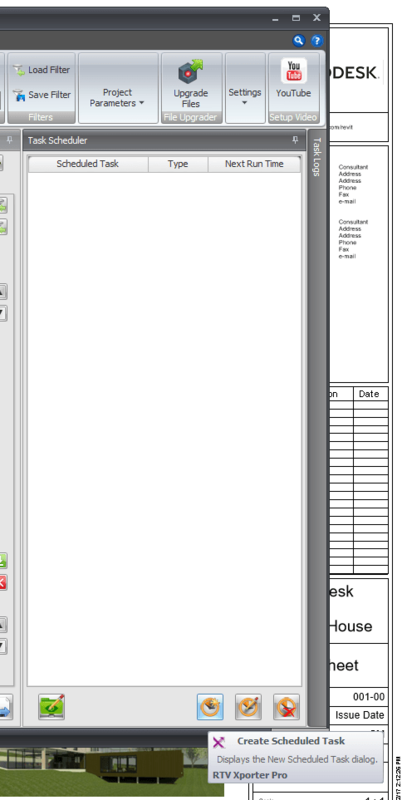 As you can see, I chose to Detach and Audit and then Save the file over the top of the current file in the same location. This way, all of the Revit links should be maintained once the whole dataset is upgraded to the new version. After saving the task, open in Windows Task Scheduler and you can run it immediately. The screenshots below show the important stuff from the above steps. 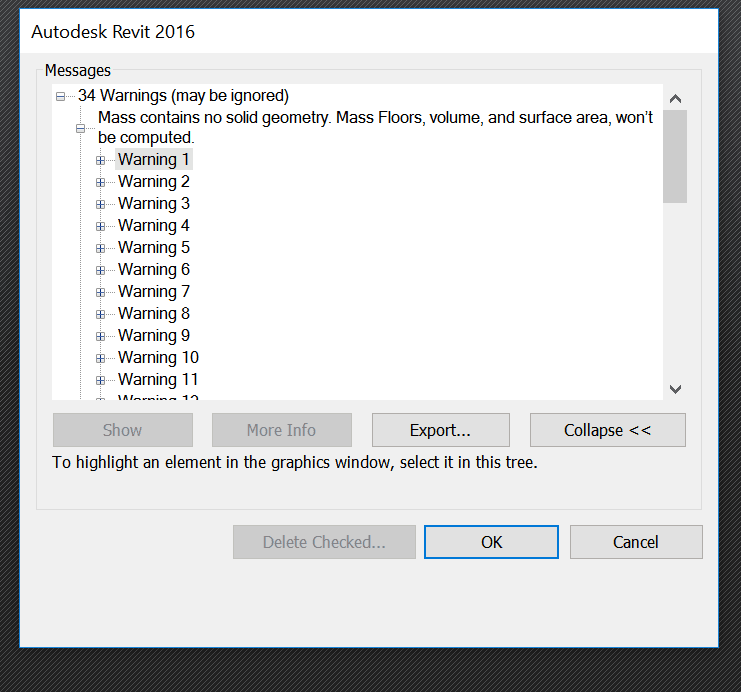 Tip: During a typical file upgrade, Revit will often come up with warnings. 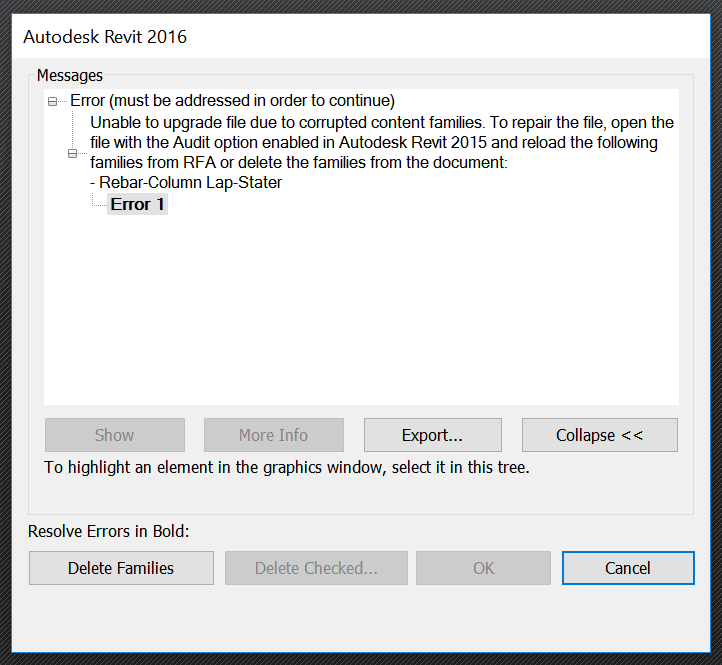 If you run the RTV File Upgrader task in Interactive mode, you will get the dialog box which requires user interaction (export warnings and proceed past the Revit warnings). However, if you run the upgrade from the Task Scheduler, it will automatically dismiss the warnings for you as it upgrades. Some examples are warning dialog including errors like ‘could not cut instance out of wall’. In the Scheduled Mode, this process will all happen unattended. Harry Mattison has built a powerful Bulk File Upgrader addin that has a lot of good reviews on the App Store. You can find it here. BIMWERX Batch File Upgrader. Very simple UI and good reviews. You can get it here. NTI Tools have a File Upgrader. You can get a trial at this link. You have to register and then get an email with the download. Using this definition or the Rhythm node, as per this forum post. Upgraded Batch utility and journal for Fam upgrades. Does TPS of OS/LW/LT, and does Parameter Re-order in 2015. Run this utility, then run the Family Categorizer – instant and up to date Family Library! This has been a ‘best practice’ rule for a while now, but it still applies, even in 2017. 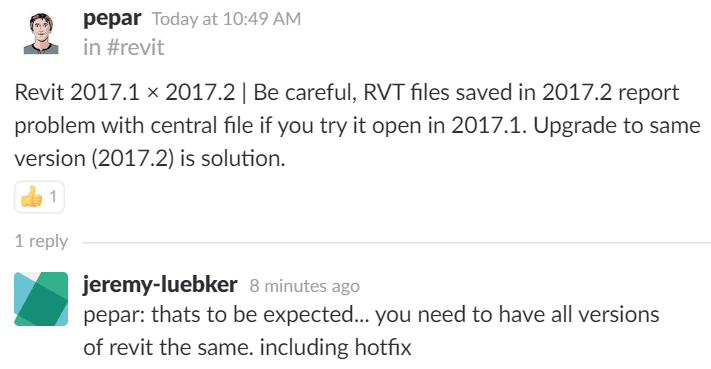 You should not mix Revit 2017.1 and 2017.2 on a single Central File. This was flagged by pepar in the BIM Experts Slack Group. 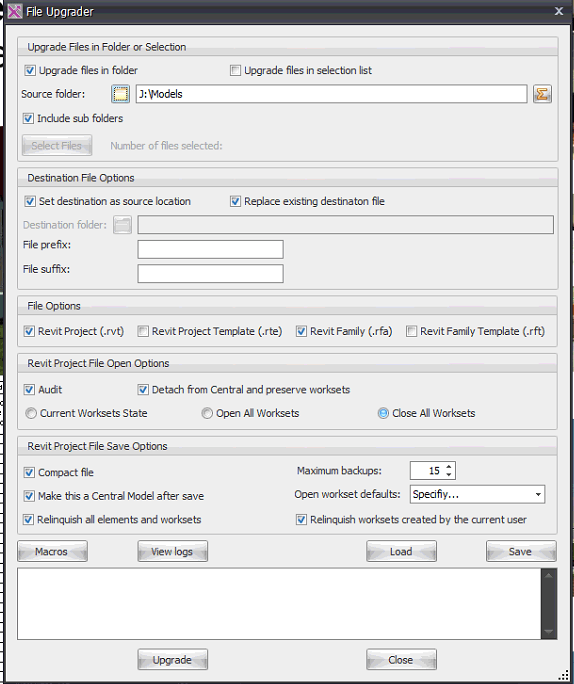 This Bakery node or the Revit Properties extension may assist you in checking Revit build. In Revit, each Link is bound to both a Type and an Instance. 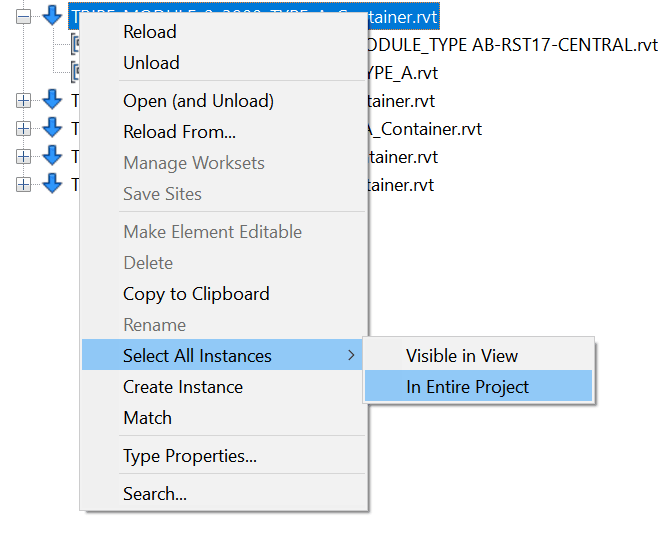 So you can have one Link ‘Type’ – relating to a single RVT file that is linked into the project. But it can be placed multiple times in the project, thus having multiple instances. In workshared projects, the Type and the Instance can belong to different Worksets. 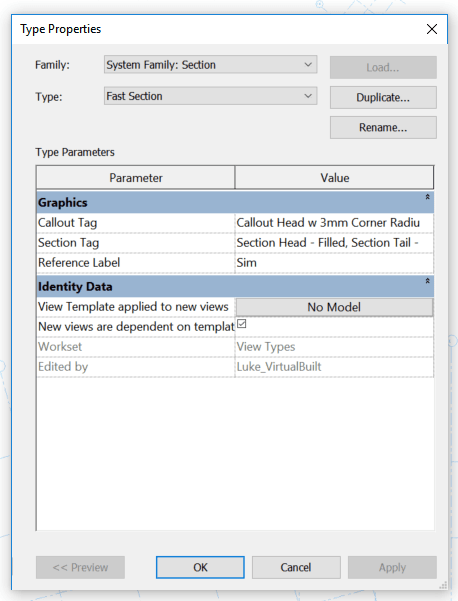 Did you know you can use Linked Views to display two identical copies of the same linked model in different ways? Then, set up two different Linked Views in that linked model. In this particular case, I want to use a model converted from ArchiCAD to a single Revit file. But I want to be able to separately load and display the Site objects, and the Building objects. So I have an Link Instance for each, and linked views for each. The whole rig can be seen in the image below. Using the worksets, I can separately Load / Unload each Instance (closing a Workset unloads any Link instances on that Workset from memory). And using the Linked Views and Overrides for the Instance, I can display each instance as I like. I can also load both instances and show both in a ‘combined’ view. 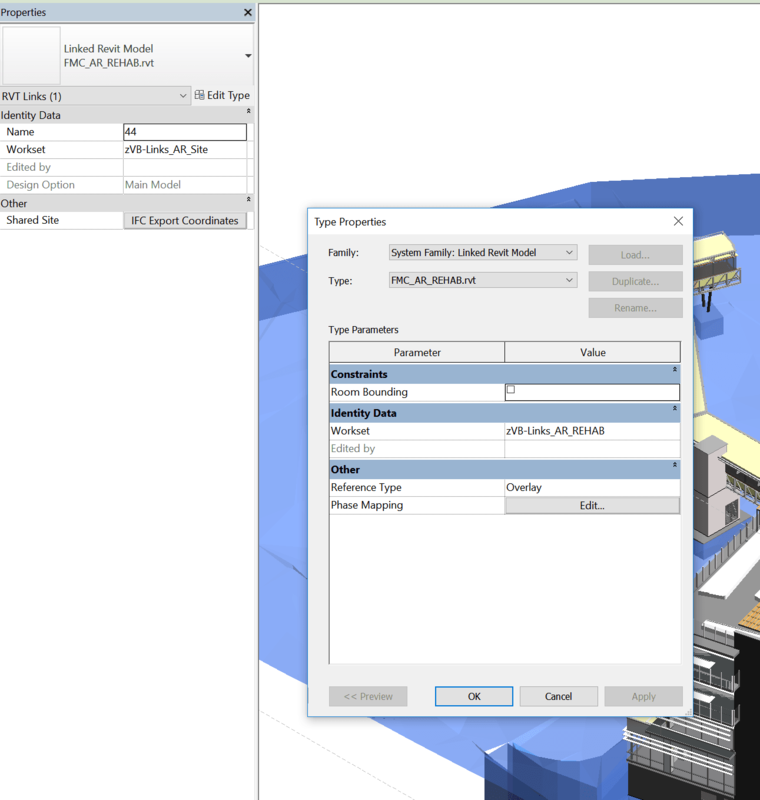 A federated Revit model is a model containing many Revit links, and they can be quite slow to work with. There are a few steps you can take to speed things up, and one of them is creating a set of fast view types and a related view template. Now, when cutting sections or making new floor plans using these ‘fast’ view types, the view will generate quickly without any model elements. Then, you can decide if you want to switch view templates / types to something more useful for coordination or documentation. Firstly, certain Electrical penetration families were not tagging for height when using Spot elevations. These elements were in a model, which was linked into another model. The fix? Super weird one. Try turning on Lighting Fixtures in your View (in the host model). Then, those spot elevations worked… Even though the penetration family was a Generic Model with Nested Mechanical Equipment inside a link file. I’m thinking this one was either an upgrade error, or perhaps the families had some earlier history as a Lighting Fixture?!? Secondly, I came across a Structural Consultant Design Model in Revit 2015 that doesn’t want to upgrade to Revit 2016. This is due to some corruption inside various families. Here are a few things to try… along with the ultimate solution. 1) Try opening the model in the newer version of Revit with Detach and Audit ticked, and choose Specify from the Worksets dialog dropdown. 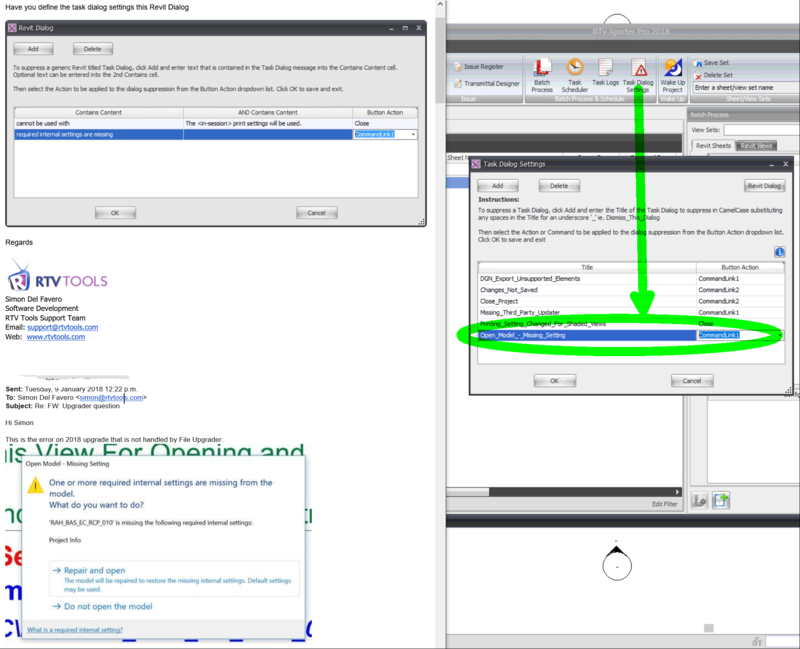 If the Opening Worksets dialog appears, Close all the Worksets and press OK. Then, Detach and preserve worksets. You should see the Model Upgrade progress dialog. The file cannot be opened. There are too many elements missing in it. Please contact Autodesk Support.